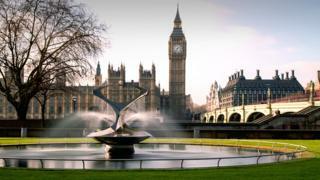 They were designed to bring public spaces back to life after World War Two - it was art for everyone. 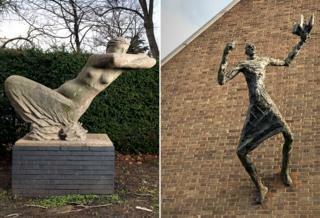 Now dozens of post-war sculptures are being given listed status. 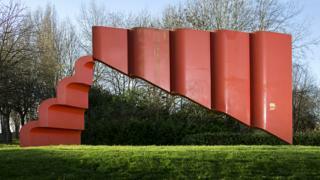 The bright red, welded steel structure above - at Milton Keynes in Buckinghamshire - appears to defy gravity and the rules of balance. It was created in 1970 by Bernard Schottlander. He fled Nazi Germany in 1939 for Leeds, where he worked in a factory as a welder while attending evening classes in sculpture. 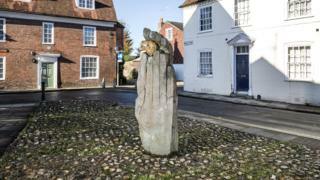 Working with Historic England, the government has now given his sculpture added protection. 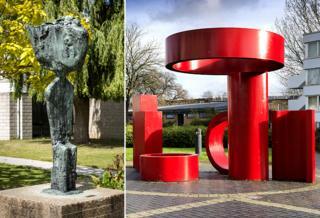 Scroll down and see the 40 other artworks granted Grade II or Grade II* status across England. This piece is typical of the monumental abstract bronze sculptures that characterised the late career of Moore - one of England's most important avant-garde artists. 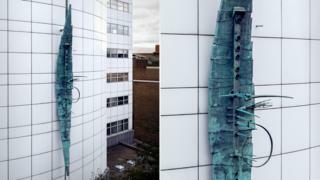 This is one of Gormley's first public sculpture commissions and his first to be listed - as it is now over 30 years old. It shows a human figure cupping its ear to listen. Rooted to a huge granite boulder, it embodies the relationship between the interior world of the human body and its surroundings. 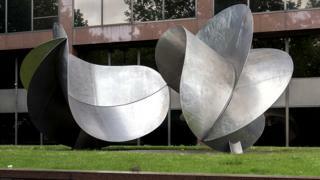 In the garden of St Thomas' Hospital, across the river from the Houses of Parliament, these abstract curved steel plates form a fountain and used to revolve. These sweeping curves of stainless steel - south of Waterloo Station - are said to be based on a pair of large, twisted bronze earrings worn by Fulani women in Africa as part of their marriage rituals. FE McWilliam's totemic Father Courage embodies themes explored by several sculptors in this period of political and social change. Its name refers to the play Mother Courage by Berthold Brecht, which denounced the horrors of war. Schottlander's 3B Series No 1 is a large scale abstract collection of bright red geometric shapes. 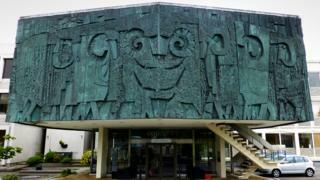 The university's architects Yorke, Rosenberg and Mardall commissioned art to complement their buildings. Rosenberg felt his "white tile buildings needed colour and visual stimulus". 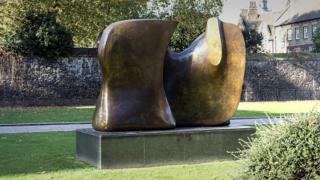 Phillip King spent a year as an assistant to Henry Moore in the late 1950s. 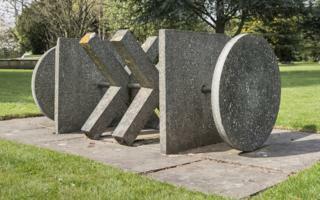 He came to prominence in the 1960s as a member of the group of young British sculptors known as the New Generation. 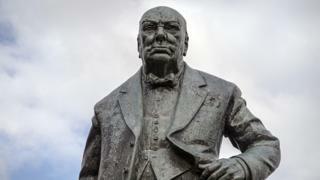 This bronze sculpture - depicting the UK's wartime prime minister in his later years - can be found in the old Woodford constituency which Churchill served as MP from 1945 until 1964. Churchill attended the unveiling and reportedly liked McFall's creation. Hungarian Peri was largely ignored by the 20th Century British art establishment, which some have attributed to his communist leanings. 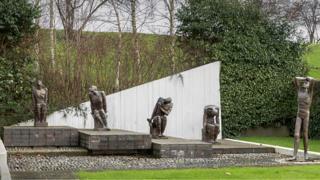 These three works were commissioned in the austerity years after WW2 on a social housing estate, with Following the Leader created as a poignant dedication to children who lost their lives in the Blitz. Fleischmann's miner incorporates a cutting drum - a genuine piece of mining machinery - and celebrates the technical advances in mining and the strength of man. Originally commissioned by the National Coal Board for its north-west headquarters, it now stands near to the closed Ravenhead Colliery. 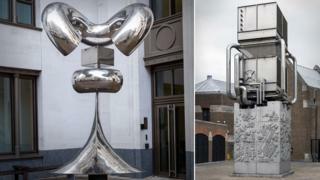 On the right, Martin's creation is the monumental culmination of his Oscillation series, inspired by the physics of pendulums combined with jazz and other music rhythms. This particular piece is the visual representation of the mathematical formula of jet propulsion, and was made in the workshop of the University of Cambridge's engineering department. 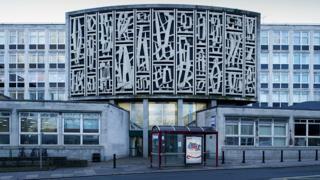 The crowning glory of the Mechanical Engineering Building at the University of Leeds, the dynamic shapes symbolise the struggle between man and machine. It is made from lightweight glass fibre-reinforced polyester (GFRP) shaped from handmade clay moulds. Made from glass-reinforced plastic, this is a stylised flock of sheep complete with careful detailing of their curled horns, cloven hooves and thick fleeces. It was commissioned for the new Technical Centre of the International Wool Secretariat, an organisation established to promote the use and trade of wool in response to the increased use of synthetic fibres in the mid 20th Century. A pair of large, rough-hewn hands emerge from cobbled ground clasping a precious golden stone. 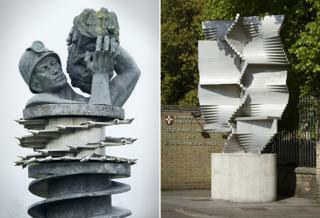 The piece was designed as part of a restoration project that transformed nearby redundant buildings into a museum. Both these examples appear gravity-defying. Vogel's Leaning Woman is tilted and twisted into an intriguing arrangement of parts, so it can be viewed from several sides. Peri's Preacher - a striking, long-limbed figure grasping a prayer book - is made up of a dark, textured mix of concrete, resin and metallic powders developed by Peri and dubbed Pericrete. Family groups were a popular theme for public space artworks in post-war Britain, and it was a sketch of his friend teaching her adventurous baby son to walk that inspired Czech-born artist Belsky. 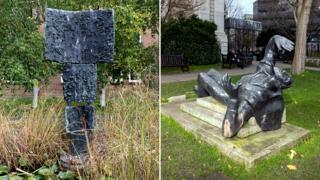 Wynne's hulking marble sculpture depicts Guy the Gorilla, a popular resident at London Zoo and something of a national treasure from the 1950s through to his death in 1978. This was named after a hill in Cornwall which is surrounded by ancient stones worn by the weather. 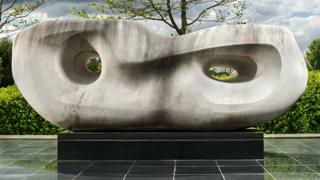 "The stone is myself," Hepworth said, "looking out to the Atlantic with the sound and smell of the sea." 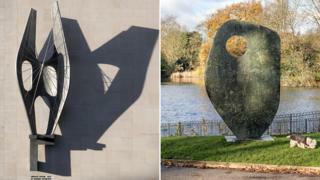 Hepworth's Winged Figure is an Oxford Street landmark. Unusually, it is in the same position and context for which it was originally intended as a commission - for the John Lewis department store. Single Form was Hepworth's personal response to the death of her friend, the UN Secretary-General Dag Hammarskjold - who was killed in a plane crash while on a peace mission. It was the model for a much larger version outside the United Nations Secretariat building in New York. Zemran is part of Pye's series of geometric sculptures made in tubular stainless steel. 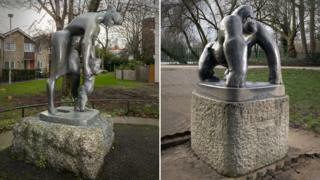 Dobson's London Pride - two serene, voluptuous female figures - was commissioned for the Festival of Britain in 1951. Originally made of plaster and finished in gun metal - which reflected post-war austerity - it was recast in 1986 in bronze at the behest of Dobson's widow. 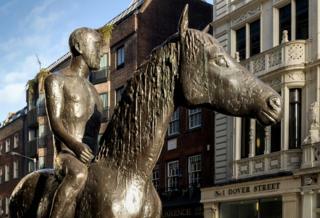 Figurative sculptures of animals dominated Frink's work, and this man and horse is now found surrounded by coffee shop tables, opposite The Ritz. 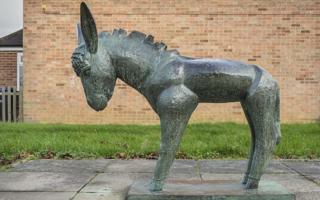 This little donkey stands at the heart of a housing scheme in Harlow - one of the post-war new towns. It was created to encourage children to explore art through play - the donkey's back has been worn to a shine. The left-side image depicts two women caught in a bomb blast, holding a banner with the word "HELP". McWilliam was Northern Irish and he created Help! in response to the Troubles there - with particular reference to the bombing of a Belfast tea room in March 1972. When Elisabeth Frink was asked why FE McWilliam's life-size bronze portrait of her carried no inscription, she remarked "one can't be labelled until one is dead". 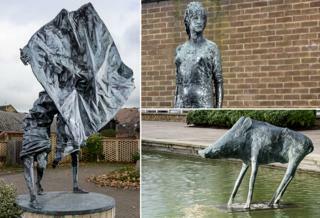 Frink's own Wild Boar sculpture was one of her first major public commissions for the pioneering Harlow Art Trust. 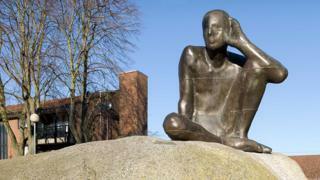 Created by Croatian-born artist Oscar Nemon, the bronze sculpture of the founder of psychoanalysis is a public memorial to him and his residence in this part of north London. 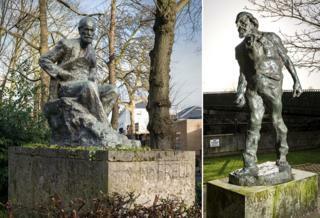 On the right, the portrayal of the eminent artist Augustus John sits on the banks of the River Avon in Fordingbridge - where he lived for the latter part of his life. Brazdys' seemingly gravity-defying set of weighty, stainless steel forms appear effortlessly balanced on top of each other. 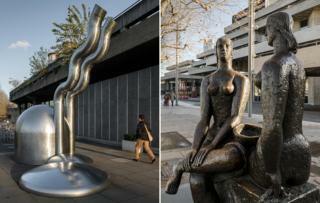 It was one of the first abstract works of public sculpture in the City of London. Paolozzi's interest in machines and technology influenced his work, and this cast metal sculpture covers a London Underground ventilation shaft. This sharp, dynamic sculpture cast in bronze originally lit up. Commissioned by Thorn Electrical Industries for their headquarters in London, it is said Clarke came up with the design after studying old light bulb filaments. Witch of Agnesi hovers like an apparition above a still pool of water, where its varied forms are reflected and distorted. The title refers to a mathematical curve defined by Maria Agnesi, an 18th Century Italian Mathematician. Bainbridge Copnall's work depicts Thomas Becket at the moment of his murder inside Canterbury Cathedral. It was created to mark the 800th anniversary of his martyrdom. 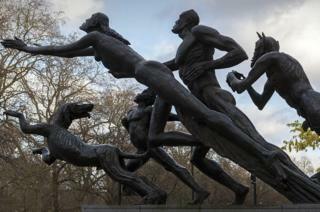 Also known as Rush of Green, this work depicts a family and their dog rushing eagerly towards Hyde Park. They are urged on by Pan - the Greek god of the wild, shepherds and flocks. 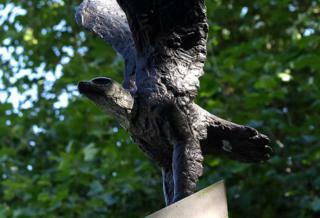 Atop an obelisk in Grosvenor Square Gardens sits an American Eagle. It commemorates 244 US citizens - plus 16 British fighter pilots and other personnel - who served in three RAF Eagle Squadrons prior to the participation of the US in WW2. Kormis explored the themes of freedom and captivity. Here, he created five male prisoners, each in a different stage of emotional turmoil.